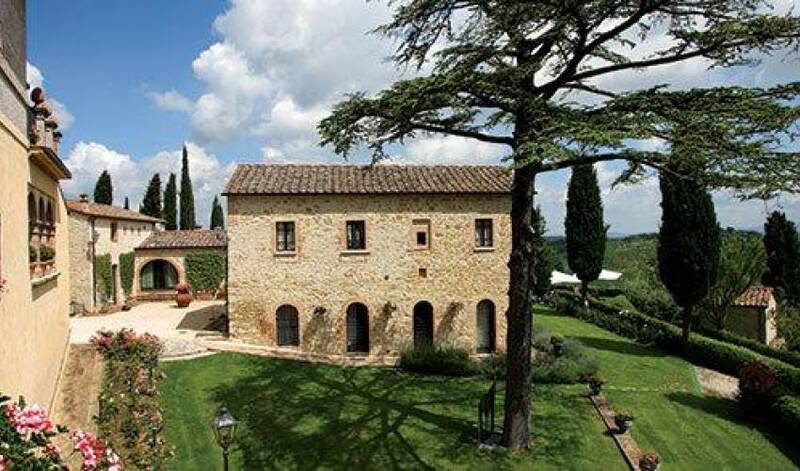 This splendid residence, which dates back to 1400, is located in the heart of the Tuscan countryside, between Florence and Siena and is an ideal place for those who love peace and quiet, being surrounded by nature, and living the atmosphere of the times gone by. 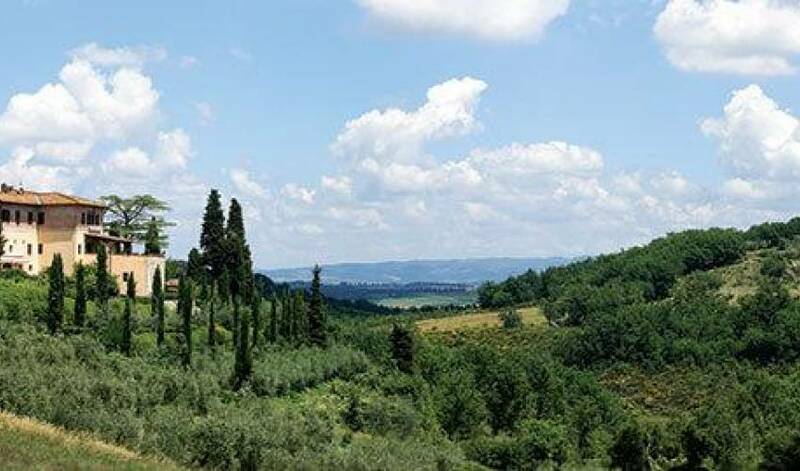 In fact, the villa still preserves all its ancient charm, thanks to the attentive and meticulous restoration work which has just recently been completed. The interiors have been elegantly and tastefully furnished and particular attention has been given to every detail. The outdoor areas that surround the house consist in a age-old garden and various furnished areas, a large terrace that slopes down towards a green area where there is a large barbecue, where you can enjoy pleasant outdoor dinners lit by torches and branched candlesticks, and the swimming pool area that is furnished to perfection with sunbeds and gazebo for relaxing while admiring the splendid panorama. 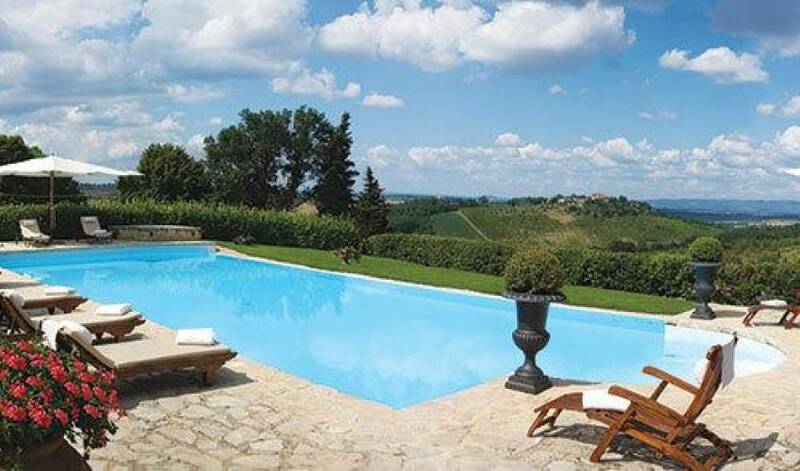 In addition to the swimming pool you will find a jacuzzi tub for 8 people and a tennis court with synthetic surface. A sauna has been created in the changing room of the swimming pool, while a gym is located on the ground floor of the dependance. 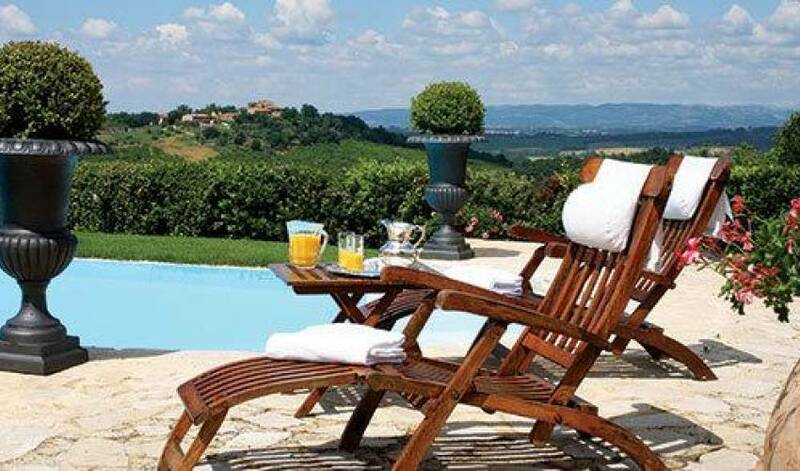 The villa has 13 bedrooms with private bathroom, elegantly furnished each with different colours and decorations and can accommodate up to 25 people. The dependance can accommodate 6 more people and, if needed, 2 extra bedrooms can be rented, bringing the total capacity up to a total of 35 people. Equipment: satellite TV (plasma screen), CD/DVD player, 2 playstations, 1 Xbox, billiard's, Internet connection, 1 fax line, 2 telephone lines, air conditioning. 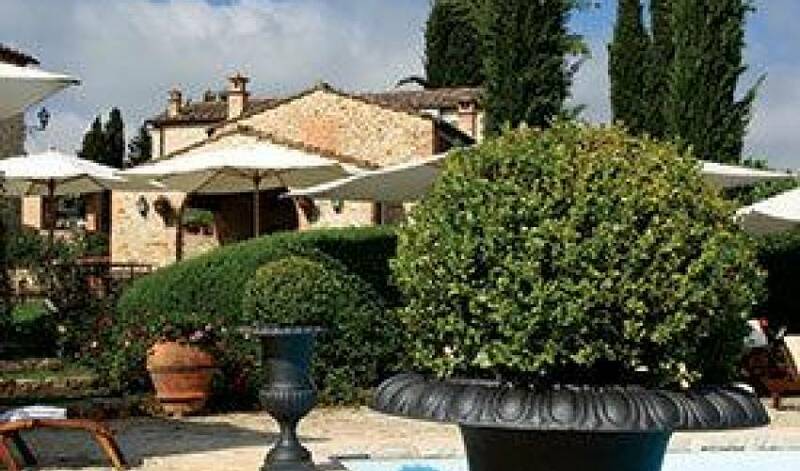 On request, the following can be organized: tours of the most important wine cellars and tastings, hot-air balloon excursions, day trip on boat around Monte Argentario, massages, cooking lessons, horse-back riding. Small aeroplanes and helicopters can land near the villa approx. 2 km away. 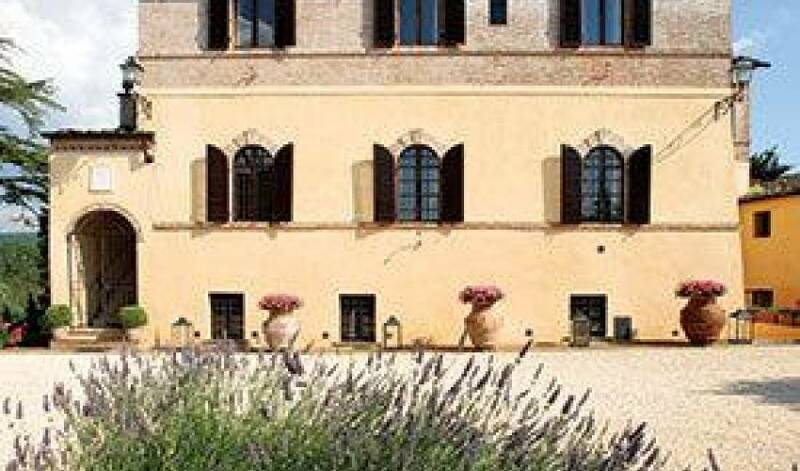 The nearest town with all kinds of shops is Colle Val d'Elsa 8 km, Siena 30 km, Florence 55 km. FIRST FLOOR: large lounge with fireplace, dining-room made up of three adjacent rooms that face a courtyard that can be used for outdoor dining, professional kitchen, 1 suite with double sofa bed and double bedroom with bathroom and double shower, laundry room used by the personnel. LOWER FLOOR: billiards' room, wine cellar, grindstone room from where you access outside. FIRST FLOOR: entrance room, TV room, chaple, game room with TV and bar, 1 bathroom with shower, 5 double bedrooms with bathroom (1 with jacuzzi bathtub, 3 with bathtub and 1 with shower), 1 single bedroom with small double bed with bathroom with bathtub. SECOND FLOOR: 4 double bedrooms (3 with bathroom with bathtub, 1 with bathroom with shower), 2 double bedrooms with bathroom with bathtub. GROUND FLOOR: reception, 1 suite with lounge and double bedroom with jacuzzi bathtub. FIRST FLOOR: 1 suite with lounge, small kitchenette, double bedroom with bathroom with jacuzzi bathtub and overhead gallery with TV lounge, 1 double bedroom with bathroom with jacuzzi bathtub. Daily cleaning service. The domestic staff consists of a coordinator 6 days a week and 4 domestics, from 8.30 to 13.00 and from 17.00 to 22.30, 7 days a week (for one day only 3 domestics). 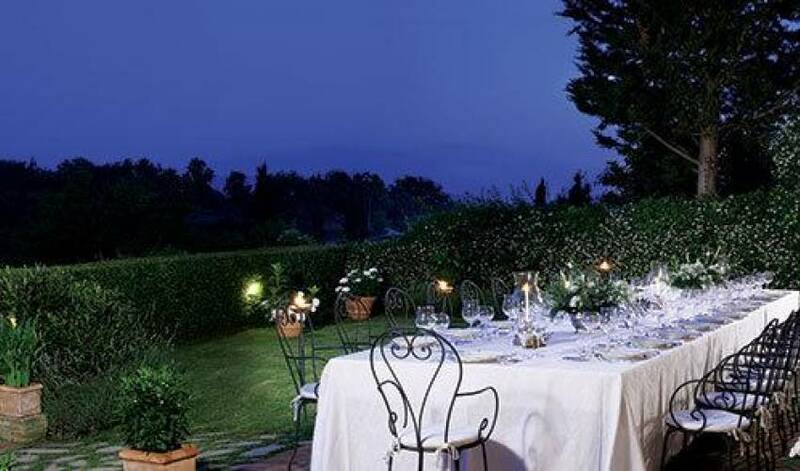 Welcome dinner on Saturday, bed and bath linen with twice weekly change, electricity included up to a consumption of 200 kw per week, internet connection, towels for the pool: up to 40 towels per week. When the property is occupied by more than 25 people an extra member of staff is required for 6/8 hours per day at an hourly cost of Euro 10. Extra cleaning hours, Euro 10 per hour, use of the telephone or fax, gas for heating, electricity over and above 200kw per week, shopping for food and drink to be paid on presentation of the receipts, laundry service, shopping service at a cost of Euro 50 each time. Continental breakfast Euro 10 per person per day. Preparation of dinner: 1) menu of 5 courses with waiting at table Euro 40 per person per day, drinks excluded (for a minimum of 25 people). 2) Euro 350 for cooking service, buying food and waiting at table, as well as the cost of the food to be paid on presentation of the receipts. If you require the preparation of lunch this should be arranged on the premises with costs to be agreed, waiting service not included. On arrival a deposit of Euro 5000 (per week) must be left for buying of food and consumptions. The cost of extras are subject to a tax of 10% (VAT). The deposit of Euro 5000 must be paid to the agency who will arrange for it to be repaid in its entirety at the end of the stay: if there are any damages during the stay, these will be deducted accordingly and paid to the owners.